We love receiving our newsletter about all things local. Uley Village News is published monthly and distributed to all residents, as well as being available at Uley Coummunity Stores and St Giles Church. It’s an initiative supported by St Giles and the Parish Council and each edition is currently voluntarily edited by the wonderful Bex Davis with administrative support from her other half, Terry Murphy. Distribution is diligently managed by Linda and John Duffet who co-ordinate a whole network of other resident volunteers who post them through letterboxes across the parish. Another successful community collaboration which we all appreciate! Costs are also covered by advertising so if you’re interested in reaching a rather unique bunch of villagers who love their community please get in touch with Terry. 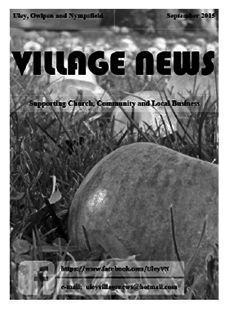 Uley Village News is now available online as a PDF download. And follow them on Facebook for those extra snippets of news.